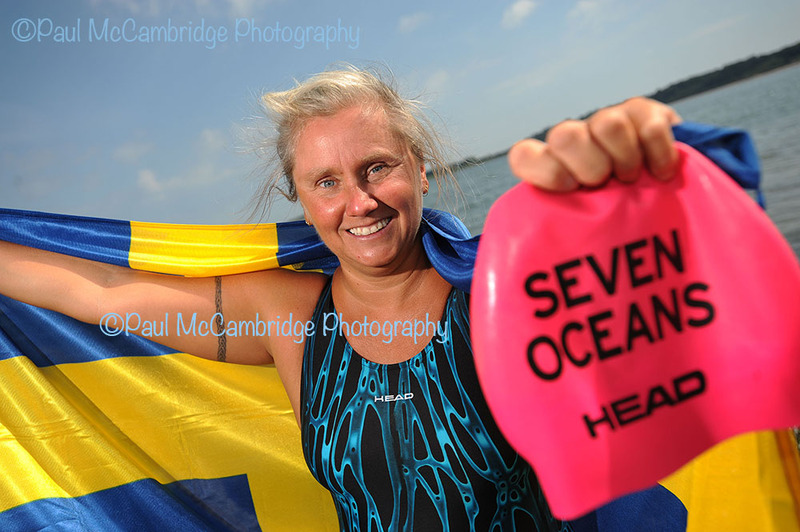 On the 8th July 2013 at 7.11pm, after 14 hours and 21 minutes swimming from Portpatrick in Scotland to Blackhead Bay, Northern Ireland, Anna-Carin Nordin made history as the first woman to complete the Seven Oceans Open Water swimming challenge. Meeting up with Anna the day after her achievement, she looked fresh and was happy to talk about her journey from the English Channel in 2010, around the world in swims and back. After such a long day before she was still keen to get back in the water for a “cushy” swim and I had the honour of a relaxing dip with this history-maker on another sunny day at Ballyholme. Brian Meharg, pilot of Anna’s support boat and Anna took the controversial decision to attempt the swim on a spring tide as the race was on with Anna one of three ladies hoping to complete the North Channel this year and scoop the Seven Oceans 1st Lady title. Finishing at 7.11pm on Monday 8th July 2013, Anna was greeted by ILDSA President Billy Wallace at Bangor Marina and Stephen Redmond, the first man to achieve the Seven Oceans, ‘phoned the first lady with his congratulations. Anna will go home to Jattendal, Sweden to a hero’s welcome. Well done Anna and thank you for the swim and the chat. This entry was posted in Wild Swimming, Wild Swimming Ireland and tagged 1st female, Anna-Carin, Anna-Carin Nordin, Ballyholme, Bangor, Co Down, girl, Ireland, marathon swimmer, Maureen McCoy, Mo McCoy, Nordin, Northern Ireland, Ocean seven challenge, Oceans Seven, open water, Paul McCambridge, relax, Sea, Seven Oceans, Seven oceans challenge, Sun, Sweden, Swedish, swim, Swimmers, swimming, water, wild, wild swim, world record, World's first by wildswims. Bookmark the permalink. Congrats to the First Lady of Ocean’s Seven! a shout out from Dallas Texas! Just wanted to tell you keep up the great work!